One year ago, at 18:30 BST on 22 April, 2013, the shock news broke - a major doping scandal at the heart of horse racing's biggest global thoroughbred operation. The powerful Godolphin team called it "a dark day for racing" as 11 of its horses were revealed to have been injected with banned anabolic steroids. Founder Sheikh Mohammed, the ruler of Dubai, was said to be "absolutely appalled". More positive tests followed, a separate drugs controversy unfolded and two Newmarket-based trainers were banned for a total of 13 years. BBC Sport examines the changes that have been made to the rules and testing, asks what might happen next and looks at some unresolved questions following a watershed moment for racing. In a Godolphin statement, trainer Mahmood Al Zarooni admitted a "catastrophic mistake" in giving the steroids to horses, including the unbeaten filly Certify, who had been due to run in the 1,000 Guineas less than a fortnight later. The British Horseracing Authority (BHA), concerned by the effect that rumour and uncertainty would have on betting markets, swiftly issued notice that a disciplinary hearing would take place as soon as possible. 9 April - Moulton Paddock Stables, Newmarket, visited by a BHA team which tests 45 horses. Trainer Mahmood Al Zarooni is in Dubai. 22 April - Godolphin issues a media statement saying 11 horses, including unbeaten 1,000 Guineas contender Certify, had tested positive for banned anabolic steroids. Al Zarooni admits to a "catastrophic mistake". 25 April - Al Zarooni is banned from racing for eight years after admitting doping. He also confessed to giving banned substances to four more horses, and all 15 are banned from racing for six months until 9 October. 29 April - Butler, in an interview with the Independent newspaper, reveals he is facing a BHA inquiry for administering anabolic steroids. Sheikh Mohammed ordered a lockdown of the Moulton Paddock stables in Newmarket, where Dubai-born Al Zarooni had operated for approximately three years, as a major internal inquiry began. Just three days after the scandal emerged, the BHA banned Al Zarooni for eight years following a hastily arranged hearing. Chief executive Paul Bittar and the-then Godolphin racing manager Simon Crisford addressed a media briefing. "I think it will take a very long time for Godolphin to regain the trust of the British public. We're shocked and completely outraged by the actions he [Al Zarooni] has taken," said Crisford. Al Zarooni had admitted to doping another four horses, with the help of two foremen and a vet's assistant. All 15 animals were suspended from racing for six months. As some in racing looked to move forward in the build-up to Guineas weekend and the season's first two Classic races, a new controversy emerged. Trainer Gerard Butler revealed he faced a separate BHA inquiry after nine of his horses had tested positive in February. The Newmarket-based Irishman said he used the Sungate product, on veterinary advice, and reckoned more than 100 horses at other stables would have been given the same treatment. While Butler gave Sungate to five horses, he injected four others with Rexogin, which contains stanozolol, and is used by human bodybuilders. He was given a five-year ban and later dropped a planned appeal. A disciplinary panel called it an "appalling dereliction of his duty". Meanwhile, earlier in the year, further tests at Al Zarooni's stable revealed seven more positive tests, including the surprise St Leger winner Encke. The Godolphin scandal highlighted discrepancies in the global rules on drugs, with Al Zarooni stating he was unaware the use of anabolic steroids was completely outlawed in British racing. In his Dubai homeland and other countries - including Australia and the United States - they had been allowed out of competition, provided they were not in a horse's system on raceday. Sheikh Mohammed has since criminalised the use of anabolic steroids in equine sport throughout the United Arab Emirates, while their use in Australia is banned on all thoroughbreds from the age of six months. The rules remain less strict in the US. How has the BHA reacted? While some criticised the BHA's speedy conclusion to the Al Zarooni case and questioned whether due process had been carried out, the governing body has been conducting a detailed longer-term review of drugs in racing. Bittar raised the discrepancy in worldwide regulation and called for Wada-style global conformity in the sport. "With horse racing subject to increasing levels of international competition, it is in the interests of the sport globally to develop a position which provides a level playing field for all participants," he said. In December 2013, the BHA published a revised anti-doping strategy, which included a doubling of testing in training and a 20% rise in raceday testing. It is thought that possible longer suspensions for doped horses could be introduced in the near future, with the results of the BHA review expected to be published within the next few weeks. A BHA spokesman said: "The report will address elements such as when do you apply the ban on steroids, how do we deal with international competitors with differing standards, how long a horse should be suspended for when found to be administered with steroids, and how we better police the out-of-training element. "Our objective is to exceed the minimum standard where possible." Fears that Sheikh Mohammed, a big employer and backer of racing with hundreds of horses, might withdraw from the sport proved unfounded. The sheikh has faced separate controversies surrounding his involvement in endurance racing, where riders compete over distances of up to 100 miles (160km) under the auspices of equestrian governing body, the Federation Equestre Internationale, of which his wife Princess Haya is president. Report concluded that owner Sheikh Mohammed had no knowledge of three drug-related incidents. 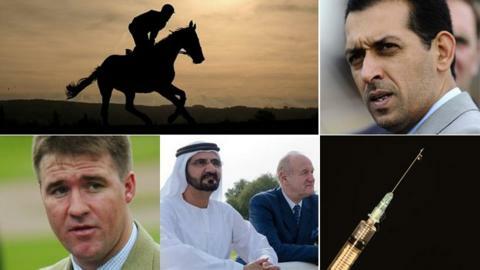 It said that trainer Mahmood Al Zarooni acted alone when doping racehorses. However "management failings, insufficient oversight and a sense of complacency within the organisation" were identified. However, on the racetrack, it has almost been a case of business as usual. Despite its first campaign for 18 years without former number one jockey Frankie Dettori, who was usurped by younger riders, the team had its most winners in a season in the 2013 campaign. Long-serving trainer Saeed Bin Suroor guided Farrh to two Group One triumphs, culminating in the Champion Stakes, while Al Zarooni's replacement, and former assistant, Charlie Appleby celebrated a first success at the Breeders' Cup meeting with Outstrip. Appleby has inherited the former Al Zarooni inmates, including Encke - who has not run since denying Godolphin's rivals Coolmore the Triple Crown when Camelot was beaten into second in the 2012 St Leger. Encke could run at Royal Ascot in June, while Certify came back with a victory at the Meydan racecourse in Dubai in February 2014. Mahmood Al Zarooni: When inquiring into the seven additional doped horses - which Al Zarooni had not admitted to - the BHA was unable to contact the trainer. He previously told of bringing the drugs into the UK in his luggage from Dubai, and handing needles from a car window to assistants at the stables, but a full timeline of his movements has never been published. Sheikh Mohammed: While his own internal inquiry, headed by former police boss Lord Stevens, absolved the sheikh of any blame, his equine interests have been under investigation elsewhere. In August 2013, the British government's Department of Food and Rural Affairs (Defra) discovered 124 unauthorised medical products at the Newmarket stables of the sheikh's endurance trainer Jaume Punti Dachs. Three months earlier, a shipment of drugs, unauthorised for use in the UK, was seized by border officials at Stansted Airport from a private jet owned by the Dubai government. Investigations are ongoing and it remains to be seen whether last year's seizures will lead to any prosecutions. The 'Newmarket Nine': An investigation following Butler's claims discovered nine Newmarket trainers used Sungate, with a total of 43 horses treated, but as there had been no positive tests and they acted on veterinary advice, they did not face any disciplinary action. Who were they? None of the trainers were named by the BHA. Vets: Three Godolphin veterinary staff quit after being asked to resign following the Stevens inquiry. But no vets have yet faced action over the prescribing of Sungate. They do not come under the auspices of the BHA, but the Royal College of Veterinary Surgeons. It says details of any investigation will only be made known once a case comes to be heard. So is horse racing in a better, or worse, position following one of its biggest scandals? David Walsh, the award-winning Sunday Times journalist who helped expose Lance Armstrong as a drugs cheat, believes racing has some parallels with cycling and accused authorities of "lacking true conviction". Those authorities would point to bans for dopers as proof they are prepared to tackle wrongdoing, and call for perspective - in 2012, the 14 positive raceday tests equated to 0.19% of the 90,174 runners in the UK. The BHA has ramped up its testing, amended some rules, closed other loopholes and would argue it has been a main driver in regulations changing internationally. Walsh, and others, say a key issue is to test horses not on licensed trainers' premises, because they are too young or injured, and there may be an increasing focus on this area in the months to come.